The STI Generation 2 double stack magazine is a redesign of the magazine STI has been manufacturing for its line of 2011 double-stack/wide body pistols. The magazine body has been set to precise and consistent measurements at the lips and throughout the length of the tube both front-to-back and side-to-side. This translates into more consistent reliability and performance. 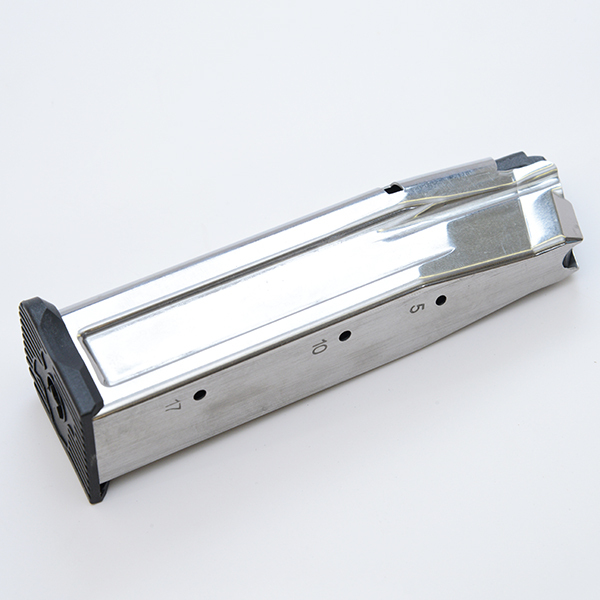 In addition, features such as witness holes and polished interior/exterior of the mag body further enhance the quality of these magazines. In the 2017 platform, the “ribs” of the 9/.38 magazine run all the way down both sides of the mag body and, thus, make the spacer unnecessary for 9mm. Consequently the 9mm and 38 Super mags are identical. You might find that the mags are stamped “9MM” but, rest assured, they are also used for 38 Super. Likewise, the 10mm and 40 S&W magazines are oe in the same. The Gen2 mags are available in 9MM/.38 and 40/10MM in lengths of 120, 126, 140 and 170 mm. The 120 mm magazine is used only with the 2011 "carry" style pistols with an abbreviated grip (e.g., Guardian 2011 and DVC Carry). The 126 mm, "carry," magazine sits flush at the bottom of a standard size 2011 grip. * It is legal for IDPA and fits the IPSC standard box. Note: 10-round Gen 2 mags are not available yet. If you are looking for 10-round magazines, check under the "original"/Gen1 magazines. Complete STI Gen1 magazine for use in 2011 double stack guns.